Rally Is a sport in which the dog and handler complete a course of sequentially arranged directional signs that identify certain movements that both handler and dog perform together as a team". These movements have been taken from traditional obedience moves, e.g.. Right Turn, Halt Hence, this sport is also called Rally Obedience and Rally O. The Handler moves continuously through the course with the dog at the handler's left side. The Judge starts off the team, and, then follows along watching and judging the execution of each move directed by the signs. Rally promotes fun and enjoyment for the dog/handler team al all three levels of competition. The handler can talk to and encourage the dog as they navigate the course. In this way Rally is a positive way to train a dog and prepare them for traditional Obedience competition and other dog sports as well. SLODOG holds Rally practices at our Saturday run-throughs (see Calendar). These are NOT formal teacher-student seminars. Rather, they are informal gatherings with "teams'" (dog + handler) of all levels. Our exercise signs are frequently double-stacked, meaning there is a Novice sign as well as an Advanced or Excellent sign on one stake, so all levels can practice on the same course at the same time. Double-stacking also provides the Novice team opportunities to become familiar with Advanced and Excellent signs and observe how they are performed. 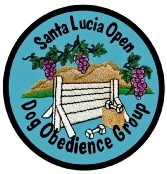 See our Calendar page for more about SLODOG Saturday Run-throughs.